Realisto Consulting SL considers data protection as one of its highest priority. We process the personal data you forward to us when visiting our website in accordance with current Spanish data protection law. When you visit our website or read our marketing e-mails, information about you is being collected. Personal data provided during registration for the service is being stored (e.g. name, address, e-mail, other contact information) or by simply browsing our website. Below you can find processes that we conduct to ensure personal data about you as an individual or legal entity are being managed legally. 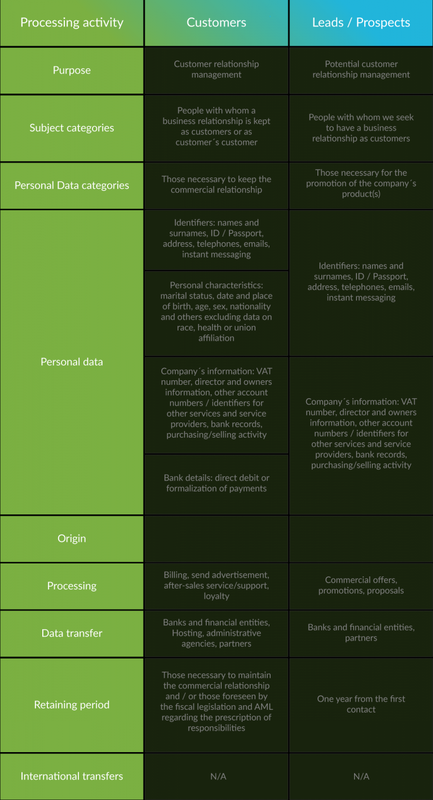 Certain parts of your personal data are needed for legal aspects of conducting our business. Realisto Consulting SL strives to provide you with the best service possible keeping your personal data secure at any stage. Realisto Consulting SL collects provided by end-users for rendering the services offered on our website to you, for internal statistical purposes, for improvement of our services and website, for communicating with you, and for fulfilling legal requirements. Realisto Consulting SL confirms that addresses will not be sold or forwarded to third parties. All personal data is processed in accordance with the Spanish data protection law. Realisto Consulting SL states that it will not forward such personal data to third parties other than its business partners, and will only use it for the intended purpose. You acknowledge and agree that in the course of fulfilling our services for your, your personal may be accessed in, transferred to, and used in countries with laws that may not guarantee the same level of data protection as in Spain. Regarding your payment transactions, we do not collect, nor record nor store any credit card. We provide PCI self-assessment questionnair. By using this website, you declare that you agree to Realisto Consulting SL processing your personal data in the manner described herein and for the mentioned purposes.